The cuisines, if you call them that, of Northern Europe have been maligned, and fairly, in many cases, for years. The food having been considered by some commentators to be so bad that it was posited as a contributing factor to the higher rates of suicide in those areas. Indeed, anyone who grew up on the same sad, grey school lunches as I might be forgiven for contemplating throwing in the towel rather than facing another plate of limp, farty cabbage and gristly stewed mutton. That we were also forced to wear shorts year-round except when there was snow on the ground, a memory that brings a shiver out of me even now, helped make life feel grimmer than it might otherwise have. This dress-code paired with the inevitable childhood tumbles from kicking a ball around the crumbling asphalt schoolyard and the scarcely-believable application of witch hazel to open wounds and grazes left me, literally, scarred for life. Happily, things have come a long way since those dark days of yore and I understand that English school children these days are allowed to wear long trousers. I invite our UK-based readers to let us know whether any appreciable improvements in the quality of school meals have been made, although, in fairness, when I started secondary school (high school) the quotidian presence of baked beans and potato croquettes made bearable even the most dismal, wintry Manchester day – yes, especially after a freezing hour of enforced lunchtime tackling practice on the gelid rugby field. I might be forgiven then for having difficulty considering cabbage worthy of consumption at all, let alone making it central to a special birthday dinner. However, I was persuaded to reconsider this childhood bias recently by my contemporary Andreas Viestad. Although he grew up rather closer to the land and sea than I, he regularly acknowledges that the food he and most Norwegian kids grew up on was neither of the highest quality nor was it prepared with a great deal of care. Indeed, some of his shows feature his work to introduce fresh, wholesome foods to urban kids in Oslo. In his book on Norwegian cooking, Kitchen of Light, he demonstrates a rare talent for making the simplest, plainest foods seem appetizing and strangely innovative. Simple flour-dusted river trout, stuffed with borage leaves and fried in butter; grilled salmon steaks with lemon verbena leaves; and the like. Viestad’s cooking is also known for his pairing of sweet and tart elements, particularly in his sauces: Norwegian heather honey with lingonberry or cloudberry preserves. Incorporating some of these elements in my thinking as I prepared Amy’s birthday dinner recently, I opened a can of duck foie gras we smuggled back from Quebec last summer, shed my age-old fear of cabbage, and prepared what turned out to be a show-stopper and a heart-stopper in equal measure. Plain, old green cabbage was cooked slowly with garlic in bacon fat, white wine, and juniper berries just until it softened and took on the smoky and astringent, piney flavors. In a separate saucepan, I bashed up a couple of handfuls of ripe blackberries with a wooden spoon before simmering them in balsamic vinegar and pomegranate molasses with a sprinkle of mustard seeds until the mixture thickened and developed a perfect sour-sweetness accented by a peppery heat. 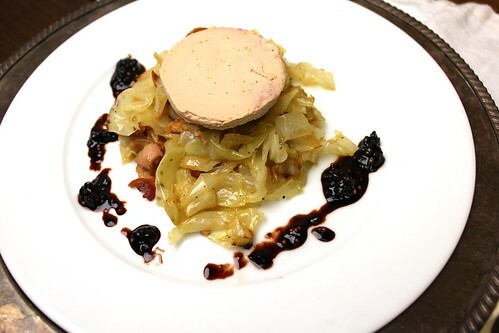 Dressing the plate with this shiny, purplish gastrique, I topped the disorderly pile of steaming, bacony cabbage with a thick slice of foie gras, letting the underside of it soften momentarily before serving it with a bottle of chilled muscat from Cape May, NJ. Sure enough, it was absolutely nothing like school lunch. Both Amy and I were very glad. In a large saute pan over medium heat, sweat off the bacon until most of the fat has rendered and lardons are crispy and nicely browned. Remove bacon to a plate and add chopped cabbage. Cook for five minutes on medium or until wilted but still al dente. After two minutes, crank up heat to high and add wine and crushed juniper. When wine has almost completely reduced, kill heat, taste and correct seasoning. In a small saucepan over medium heat, crush blackberries with a wooden spoon, and allow juice to get bubbly before adding balsamic vinegar, pomegranate molasses and mustard seeds. Reduce gently, stirring regularly until mixture is thickened like a loose jam. Taste and correct seasoning. Serve immediately. 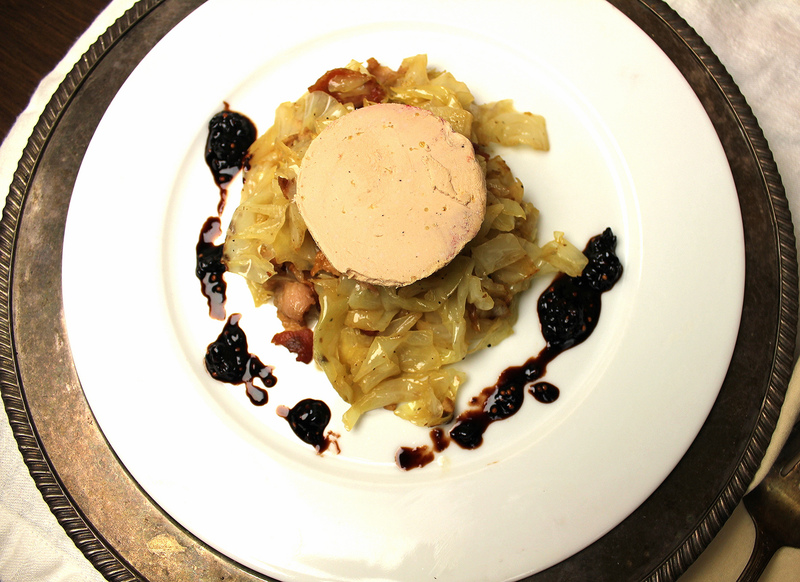 Slice the foie gras into inch-thick pieces and assemble dish. Enjoy with a dessert wine or a chilled Muscadet or Sauternes. Cabbage would not have been my first choice for a foie gras pairing but I’m imagining the taste, especially with the gastrique, and I like it. @Joan: it does seem like a slightly odd pairing, doesn’t it? The crunchiness is a nice contrast and the piney juniper berries give the whole thing a slightly wild flavor that’s very different from any other way I’ve had foie. The blackberry gastrique is rather toothsome also. I like the pairing. Cabbage can be wonderful. I use sweet and sour braised red cabbage (it has smokey bacon and its fat) against rich, flavorful duck often. The texture and acid balance the rich creamy main ingredient. 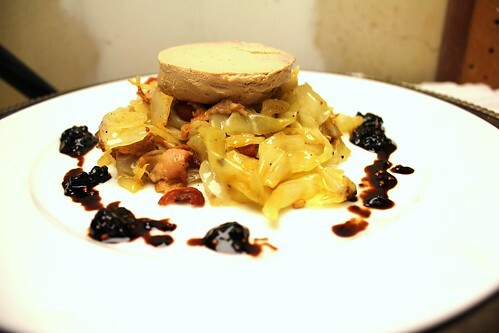 It sounds wonderful with the foie gras. I’ll try it at Christmas time when I open my wallet for that special delicacy. @Patrick: thanks for the comment! The cabbage put a few people off because it sounds so prosaic, but I agree with you, contrasting a super rich protein with something like this amplifies the richness but cuts it so it’s not overwhelming. It’s definitely a special occasion only dish. This was 8 months in the making and I think it’ll be Christmas before we go for foie gras again! I just read this post (don’t know how I missed it) and thought using prime rib, venison tenderloin, or duck would be delicious, as well! So many wonderful, contrasting flavors. A great meal for a Winter day when you don’t want to leave the house. Of course, that’s every day in the Winter for my husband and me! @Laurie: exchanging the foie for something leaner and gamier sounds like a great idea. Venison in particular would benefit from the richness of the bacon. Let us know if you make it! ← Enfrijoladas! Where Have You Bean All My Life?